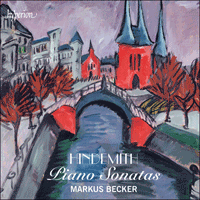 It was in the second half of Hindemith’s career—after the composition of the opera Mathis der Maler (1933–5) and the campaign against it by the Nazis which eventually forced his emigration from Germany—that Hindemith produced his major utterances for solo piano. In his three piano sonatas, all written in 1936, Hindemith presents himself not as the rebel and revolutionary of the 1920s, but rather as an heir to the contrapuntal skill and keyboard dexterity of Johann Sebastian Bach. Markus Becker has been acclaimed for his persuasive and authoritative recordings of German repertoire of the late nineteenth and early twentieth centuries. A formidable executant on several instruments (he once claimed he could play every instrument in the orchestra, at least to some extent), Paul Hindemith was a highly capable pianist. Music for solo piano featured in his output from his earliest years. Indeed his first work to be publicly performed was a set of variations for piano played at the Hoch Conservatorium in Frankfurt, where he was a student, in 1913. It was also in his student years that he made the acquaintance of two young pianists—Emmy Ronnefeldt and Emma Lübbecke-Job—who became close friends and interpreters of all that he wrote for the instrument, whether as soloist or as accompaniment. By inclination and profession, though, Hindemith was a violinist and violist, and in the 1920s, when he was making a name for himself on the international stage, his most significant chamber and instrumental compositions were for strings—large-scale sonatas, trios, quartets and so on. His piano works of the same period, by contrast, tended to be more occasional pieces: short miniatures or collections of dances, like the jazz-influenced Suite ‘1922’. He had, it is true, composed an ambitious and experimental Piano Sonata in 1920—but his publishers turned this down and now only its barbaric stretto-finale survives complete. It was in the second half of his career—after the composition of the opera Mathis der Maler (1933–5) and the campaign against it by the Nazis, which eventually forced his emigration from Germany—that Hindemith produced his major utterances for solo piano. He may have seen the instrument as the ideal medium for private meditation in troubled times, and the vehicle for a more philosophical probing into the nature of music itself. Both of these aspects may be sensed in the group of three piano sonatas which he composed in the single, fraught year of 1936. They are contemporary with his work on the textbook Unterweisung im Tonsatz, later published in English as The Craft of Musical Composition, in which he established the theoretical basis for his personal approach to tonality, counterpoint, formal structure, and indeed all aspects of compositional work. In a sense this task had been made more urgent by Nazi attacks on the ‘atonal noise’ and ‘incompetence’ of his music; the more galling for Hindemith because his mature idiom was by now consolidated and stabilized. The sonatas could be regarded as object lessons in that idiom. In them, Hindemith seems to have viewed the piano as providing a more or less neutral tone-colouring through which the movement and intertwining of tones, theme and lines could be contemplated without distraction (which does not mean they are without colour, light and shade, which any good player will want to bring out). Here, as in his near-contemporary organ sonatas, Hindemith presents himself not as the rebel and revolutionary of the 1920s, but rather as an heir to the contrapuntal skill and keyboard dexterity of Johann Sebastian Bach. The previous year, 1935, he had completed an important group of Lieder on texts by the Romantic poet Friedrich Hölderlin (1770–1843), begun while writing Mathis der Maler, and the inspiration he derived from Hölderlin carried over into the piano sonatas in an interesting way. Hölderlin, who spent some of his career in or near Hindemith’s home town of Frankfurt, became insane in 1806 and spent the last half of his tragic life confined in a tower on the city walls of Tübingen. (Hindemith himself, in Frankfurt, had made his home in another such tower, the so-called ‘Cowherds’ Tower’—‘Kuhhirtenturm’.) Though he was little known in his lifetime, German composers have turned to Hölderlin’s poetry time and again in periods of trouble and soul-searching, from Brahms (in his Schicksalslied) to the most avant-garde composers of the late twentieth and early twenty-first centuries. His Romantic extremism seems the antithesis of Hindemith’s balance and craftsmanship, though both men, in their own ways, were passionate classicists. Hölderlin is the supreme poet of regret for present limitation set against longing for a greater past; the poet of suffering mankind and heartless (or departed) gods. But his longing is never mere nostalgia: he was a passionate democrat, deeply influenced by the ideals of the French Revolution, who impatiently desired the overthrow of the old German princelings. The Classical world, so often evoked by his verse, stood for a vanished, harmonious cosmos but also as a source of new political hope, opened up by the Greek rebellion against the Turks in the late eighteenth century (the subject of his novel Hyperion). The Nazi propaganda machine attempted to portray Hölderlin as a patriotic German nationalist, but his democratic idealism gave the lie to this distortion. Thus Hindemith’s turning to Hölderlin in 1935 had a political as well as an aesthetic dimension. Although Hindemith did not formally leave Germany until 1938, he spent as much time as possible outside the country in the mid-1930s in order to avoid political restrictions and to get on with his compositions in freedom. The first two piano sonatas were largely composed during an extended sojourn in Turkey, where at the invitation of the Turkish government Hindemith was organizing the national music school in Ankara. The Piano Sonata No 1 in A major (Hindemith’s harmonic language combined elements of both major and minor, although generally these works reach a resolution in the major key), the largest of the three sonatas, has an unusual form: five movements, the fourth recapitulating the material of the first, and none of them in a conventional sonata form. This design reflects its inspiration in Hölderlin’s poem Der Main. In this ardent lyric, the German poet speaks of his desire to see distant lands, especially Greece with the monuments of its ancient culture and the idyllic life of the Greek islands, where he is ‘lured by the labyrinthine dances with wine and drum and zither’. Then he redefines this desire: he is in actuality a ‘homeless singer’ and this imagined paradise cannot replace his homeland. From far abroad he will long, even more strongly, for the place where he was once happy, by the River Main. This paean to the river that flows through Frankfurt clearly spoke to Hindemith as piercingly as it did to the melancholy Hölderlin, whose fleeting years of greatest happiness were spent there in his doomed love affair with Suzette Gontard. As mentioned, Hindemith composed his sonata even further from Germany than Greece: in Turkey, the ancient Asia Minor, where he could visit those ruins of Classical civilization (that Hölderlin, in fact, never saw) in the increasingly sure knowledge that a return to that city on the Main where his family still lived would soon no longer be possible. The sonata bears closely on Hölderlin’s poem, not so much as a programmatic depiction as an instrumental correlative: the music appears abstract in expression, and the correspondences of feeling remain implicit. The short first movement, with its smoothly flowing crotchets, acts as a lyrical preface, mirroring the poet’s opening description of the act of travel over mountain and sea. It may even be a ‘song without words’, a purely instrumental setting or reading of the first two stanzas of Hölderlin’s poem. (Hindemith sometimes treated poetry in this way, for example in his early Lustige Sinfonietta after poems of Morgenstern, and in the much later Horn Concerto which incorporates a wordless setting of a poem of his own.) This comparatively miniature movement prepares for one on a larger scale: a slow and solemn march of pronounced elegiac character, one of the most impressive and inward-looking of Hindemith’s many inventions in march style. This corresponds to Hölderlin’s invocation of the ruined glories of Classical and Heroic Greece. There follows an extended scherzo, reflecting the verses that deal with the idealized life of the Ionian Islands: it contrasts a strongly rhythmic, dance-like subject with a gentler, more song-like one, and this second idea becomes the basis of a central trio section. The fourth movement then harks back, in varied form, to the material of the first movement, just as Hölderlin at this point changes perspective and looks back, from the fantasy island that has become his place of exile, over the road travelled, to the place where he had initially set out. And accordingly Hindemith’s finale is a surging movement (Lebhaft, ‘lively’) of seemingly irrepressible motion, like the final section of the poem, which hymns the German river as it pursues its course to meet its ‘brother’, the Rhine, and finally to flow into the North Sea. The other two piano sonatas of 1936, completed after Hindemith’s return to Germany from Turkey in June, have no such interfusion of poetic content—or if they do, he kept quiet about it. The Piano Sonata No 2 in G major is the shortest and lightest in tone of the three—Hindemith himself thought of it as a sonatina. Whereas the first sonata requires a player of considerable power and authority, No 2 is consciously laid out within the compass of amateurs, clear in form and texture and with many passages in two- or three-part counterpoint. Two short, concise movements—the first as clear as Clementi, with contrasting subjects but no development as such, and then a tiny wisp of a scherzo—preface a more serious-sounding third movement which begins with gravely melodious slow music. It soon turns out, however, that these soulful strains are merely the introduction to the cheerful rondo-finale, alternately strutting and ambling in motion. Eventually the movement slows again, and a brief epilogue ends the sonata on an unexpectedly sombre note. The Piano Sonata No 3 in B flat major was composed immediately after the other two (from July to 20 August); it is on a larger scale than No 2, though structurally extremely taut, with nothing of No 1’s poetic expansiveness. Like No 1, though, it is an ambitious work, obviously written with a virtuoso performer in mind. Of Hindemith’s three sonatas No 3 approximates most closely to the classical sonata ideal—indeed to the Beethovenian four-movement archetype which had inspired generations of composers throughout the nineteenth and twentieth centuries—and its material is perhaps the most distinctive and resourcefully developed. Yet again, however, Hindemith avoids a strenuous opening movement with competing themes in sonata style. The third sonata opens instead with a lyrical, calmly flowing movement of almost pastoral character—which incidentally looks forward towards the serenely exalted idiom of Nobilissima visione, the ballet on the life of St Francis of Assisi which he was to compose in 1937. There follows an energetic scherzo and trio, and then a movement in moderate tempo which, after a quietly tramping introduction, develops into a lithe, conversational fugato. This fugal writing foreshadows the finale, which crowns the sonata with a granitic and determined double fugue. The first subject is wiry and athletic; the second is derived by variation from the fugato subject in the previous movement. At the climax both themes are combined, and the sonata ends in a mood of hard-won triumph, the final bars a monumental confirmation of the home key. The pianist Walter Gieseking, who saw each sonata in manuscript as soon as it was written, considered this sonata the finest of the three. When Sonata No 1 was first completed, it had a different second movement, entitled Variations (‘Variationen’). But Gieseking, who was scheduled to give the premiere in late 1936, requested that Hindemith should write something different, and the composer obliged with the slow march which now stands in its place. The variations remained unpublished until after Hindemith’s death. This too has a slow march subject (different from that in the replacement movement). The variations cover a wide gamut of expression, including a beautiful extended arioso variation characterized by the use of trills, but some of them are more dissonant and angular than the rest of the writing in the piano sonata, and the ending is stark and grim. It may be that Gieseking felt that the uncompromising nature of this movement might run foul of the Nazi authorities. In the event it hardly mattered: irritated by the warm reception recently accorded to a new Hindemith violin sonata premiered in Geneva—and perhaps aware of the political dimension suggested by the use of Hölderlin’s poem with its theme of exile—those same authorities forbade the planned performance of the piano sonata. There were in fact to be no further public premieres for Hindemith in Germany until after World War II. Although his publishers rushed all three piano sonatas into print, it seems that, following the cancellation of Gieseking’s proposed premiere of No 1, the actual first public performances of the first two sonatas may have gone undocumented. However, No 3 was premiered in April 1937 in Washington DC, during Hindemith’s first concert tour of the USA, by the Puerto Rican virtuoso Jesús María Sanromá (for whom Hindemith would later write a sonata for piano duet and a piano concerto). Formidable instrumentiste (il affirma un jour pouvoir jouer, dans une certaine limite du moins, de tous les instruments de l’orchestre), Paul Hindemith était un pianiste plus que compétent, qui écrivit pour piano solo dès ses tout débuts. Sa première œuvre exécutée en public fut d’ailleurs une série de variations pour piano donnée en 1913 au Hoch Conservatorium de Francfort, où il était élève. Ce fut également pendant ses études qu’il connut deux jeunes pianistes—Emmy Ronnefeldt et Emma Lübbecke-Job—qui, devenues ses amies intimes, interprétèrent tout ce qu’il composa pour le piano (solo ou en accompagnement). Mais par goût, par profession aussi, Hindemith était violoniste et altiste: dans les années 1920, alors qu’il se faisait un nom sur la scène internationale, ses plus importantes musiques de chambre et instrumentales furent des œuvres pour cordes (sonates à grande échelle, trios, quatuors, etc.). À la même époque, ses pages pianistiques, elles, tendaient plutôt à être des pièces de circonstance, des courtes miniatures ou des recueils de danses comme la Suite «1922», d’influence jazz. Il avait bien composé une ambitieuse, et expérimentale, Sonate pour piano, en 1920, mais ses éditeurs l’avaient refusée et seul son barbare strette-finale nous est intégralement parvenu. Ce fut dans la seconde moitié de sa carrière—après la composition de l’opéra Mathis der Maler (1933–5) et la campagne que les nazis menèrent contre lui, le contraignant finalement à émigrer—que Hindemith produisit ses plus grandes œuvres pour piano solo. Peut-être vit-il en cet instrument le véhicule idéal de la méditation intime, en ces temps de troubles, et de l’interrogation, plus philosophique, sur la nature de la musique. Ces deux aspects transparaissent dans le corpus de trois sonates pour piano qu’il rédigea pendant la lourde année 1936, en même temps qu’il s’attelait à son manuel Unterweisung im Tonsatz, paru plus tard en anglais sous le titre de The Craft of Musical Composition, dans lequel il établit la base théorique de son approche personnelle de la tonalité, du contrepoint, de la structure formelle et, au vrai, de tous les aspects de son travail compositionnel. En un sens, cette tâche avait été rendue encore plus urgente par les attaques nazies contre le «bruit atonal» et l’«incompétence» de sa musique, des attaques d’autant plus humiliantes que son style de la maturité s’était alors affermi et stabilisé—les sonates en sont une parfaite illustration. Hindemith semble y avoir considéré le piano comme le vecteur d’une couleur tonale plus ou moins neutre, à travers laquelle on pouvait contempler sans distraction l’entrelacs des tons, des thèmes et des lignes (ce qui ne signifie toutefois pas une absence de couleur, de lumière et d’ombre, que tout bon interprète s’attachera à faire ressortir). Là, comme dans ses sonates pour orgue quasi contemporaines, il se montre non comme le rebelle et le révolutionnaire des années 1920, mais comme un héritier de l’art contrapuntique et de la dextérité claviéristique de Jean-Sébastien Bach. Un an auparavant, en 1935, Hindemith avait achevé une importante série de lieder sur des textes du poète romantique Friedrich Hölderlin (1770–1843), qu’il avait commencée pendant la rédaction de Mathis der Maler et dont l’inspiration gagnera, d’une manière intéressante, les sonates pour piano. Hölderlin, qui fit une partie de sa carrière à Francfort (ville natale de Hindemith) ou dans ses environs, devint fou en 1806 et passa la seconde moitié de sa tragique existence confiné dans une tour des remparts de Tübingen. (À Francfort, Hindemith s’installa lui aussi dans une tour semblable, celle dite «des vachers» ou «Kuhhirtenturm»). Méconnu de son vivant, Hölderlin ne cessa d’attirer, par sa poésie, les compositeurs allemands, dans les périodes de troubles et d’introspection—de Brahms (dans son Schicksalslied) aux compositeurs les plus avant-gardistes de la fin du XXe siècle et du début du XXIe siècle. Son extrêmisme romantique semble l’antithèse de l’équilibre et de l’art de Hindemith, même si tous deux étaient, chacun à leurs manières, de fervents classicistes. Hölderlin est le poète suprême du regret des limites présentes, sur fond d’aspiration à un passé plus grand—le poète de l’humanité souffrante et des dieux impitoyables (ou disparus). Mais son aspiration n’est jamais simple nostalgie: ce démocrate passionné, profondément influencé par la Révolution française, grillait que fussent renversés les vieux principicules allemands. Le monde classique, si présent dans sa poésie, symbolisait un cosmos révolu, harmonieux, mais aussi une source de nouvel espoir politique, jaillie de la rébellion grecque contre les Turcs à la fin du XVIIIe siècle (le sujet de son roman Hyperion). La machine de propagande nazie tenta de le portraiturer en patriote nationaliste allemand, mais son idéalisme démocratique démentit pareille déformation. Se tourner vers lui en 1935 fut donc pour Hindemith un geste autant politique qu’esthétique. Officiellement, Hindemith ne quitta pas l’Allemagne avant 1938 mais, dès les années 1935, il passa le plus de temps possible à l’étranger pour échapper aux restrictions politiques et continuer de composer en toute liberté. Ce fut ainsi lors d’un séjour prolongé en Turquie, où le gouvernement turc l’avait invité à organiser l’école nationale de musique, à Ankara, qu’il écrivit l’essentiel de ses deux premières sonates pour piano. La Sonate pour piano nº 1 en la majeur (la langue harmonique de Hindemith combine des éléments des modes majeur et mineur, malgré, le plus souvent, une résolution en majeur), la plus grande des trois sonates, revêt une forme inhabituelle: cinq mouvements (le quatrième reprenant le matériau du premier), sans un seul de forme sonate conventionnelle. Ce plan reflète une inspiration puisée dans Der Main, ardent poème dans lequel Hölderlin exprime son désir de voir des terres lointaines, la Grèce, surtout, avec les monuments de sa culture antique et la vie idyllique de ses îles, où il est «attiré par des danses labyrinthiques, avec du vin, une timbale et une cithare». Puis il redéfinit ce désir: il est en fait un «chanteur apatride» et ce paradis fantasmé ne saurait remplacer sa patrie. Loin, à l’étranger, il aspirera, plus fort encore, au lieu de son bonheur passé, sur les rives du Main. Ce dithyrambe adressé à la rivière qui arrose Francfort, Hindemith le perçut manifestement avec le même déchirement que le mélancolique Hölderlin, qui passa dans cette ville ses fugaces années d’intense bonheur, au moment de sa funeste histoire d’amour avec Suzette Gontard. Comme nous l’avons vu, Hindemith composa sa sonate non en Grèce mais bien plus loin encore de l’Allemagne, en Turquie, cette antique Asie mineure, où il put admirer les ruines de la civilisation classique (que Hölderlin, lui, ne vit jamais), de plus en plus conscient que revenir dans cette cité sur le Main, où vivait encore sa famille, serait bientôt impossible. La sonate est fidèle au poème de Hölderlin, dont elle n’est pas tant un portrait programmatique qu’un corrélatif instrumental: la musique apparaît abstraite d’expression et les correspondances de ressenti demeurent implicites. Le court premier mouvement, aux noires uniment fluides, fait office de préface lyrique et écho à la description liminaire du poète évoquant l’acte de voyager par monts et par mers. Ce pourrait même être une «romance sans parole», une mise en musique ou une lecture purement instrumentale des deux premières strophes du poème hölderlinien. (Hindemith traita parfois la poésie de cette manière, par exemple dans sa juvénile Lustige Sinfonietta d’après des poèmes de Morgenstern, ou encore dans son bien plus tardif Concerto pour cor, intégrant une mise en musique sans parole d’un poème de son cru.) Ce mouvement relativement miniature prépare un mouvement à plus grande échelle, une marche lente et solennelle, au caractère fort élégiaque—l’une des plus impressionnantes et des plus introspectives inventions, pourtant nombreuses, de Hindemith en style de marche—, qui correspond à l’invocation, dans le poème, des gloires ruinées de la Grèce classique et héroïque. S’ensuit un scherzo prolongé, reflet des vers évoquant la vie idéalisée des îles Ioniennes: à un sujet dansant, très rythmique, s’oppose un thème plus doux, à la manière d’une chanson, qui devient la base d’une section centrale en trio. Après quoi le quatrième mouvement retourne, sous une forme variée, au matériau du premier mouvement, juste quand Hölderlin change de perspective et regarde en arrière, passant—via le chemin parcouru—de l’île fantasmée, devenue son lieu d’exil, à son lieu de départ. En conséquence de quoi Hindemith nous livre un finale déferlant (Lebhaft, «vif»), d’un élan apparemment irrépressible, en phase avec la dernière section du poème, qui chante un hymne à la gloire de la rivière allemande lancée à la rencontre de son «frère» le Rhin avant de se jeter dans la mer du Nord. Les deux autres sonates pianistiques de 1936, terminées en Allemagne par un Hindemith rentré de Turquie en juin, ne sont pas mêlées de poésie—ou, si elles le sont, le compositeur n’en a rien dit. La Sonate pour piano nº 2 en sol majeur est la plus courte des trois, la plus légère de ton aussi—Hindemith lui-même y voyait une sonatine. Au rebours de la première sonate, qui requiert un interprète tout en puissance et en autorité, elle est sciemment conçue pour être à la portée des amateurs: de forme et de texture limpides, elle multiplie les passages écrits en contrepoint à deux ou trois parties. Deux brefs mouvements concis—le premier, clair comme du Clementi, avec des sujets contrastifs mais pas de développement en tant que tel, puis un minuscule bout de scherzo—précèdent un mouvement d’allure plus grave, qu’inaugure une musique lente, solennellement mélodieuse. Mais ces accents mélancoliques s’avèrent bientôt n’être que l’introduction du rondo-finale enjoué, qui tour à tour se pavane et baguenaude. Pour finir, le mouvement retrouve la lenteur, et un court épilogue clôt la sonate sur une note inopinément sombre. La Sonate pour piano nº 3 en si bémol majeur, rédigée juste après les deux autres (du mois de juillet au 20 août) est à plus grande échelle que la deuxième, quoique structurellement tendue à l’extrême, sans rien de l’expansivité poétique de la première, dont elle partage cependant l’ambition (elle fut, à l’évidence, écrite en pensant à un interprète virtuose). Des trois sonates, elle est la plus proche de l’idéal de la sonate classique—de l’archétype beethovénien en quatre mouvements, qui avait inspiré des générations de compositeurs tout au long des XIXe et XXe siècles—et son matériau est peut-être le plus singulier, le plus inventivement développé. Là encore, cependant, Hindemith évite un énergique mouvement inaugural, avec des thèmes rivaux, en style de sonate, au profit d’un mouvement inaugural lyrique, au flux paisible et au caractère presque pastoral—qui, soit dit en passant, regarde vers le style tranquillement exalté de Nobilissima visione, le ballet sur la vie de saint François d’Assise qu’il composera en 1937. S’ensuivent un vigoureux scherzo et trio, puis un mouvement dans un tempo modéré qui, après une introduction au pas paisible, se mue en un fugato souple, conversant. Cette écriture fuguée annonce le finale, qui couronne la sonate d’une double fugue hiératique, déterminée. Le premier sujet est nerveux et robuste tandis que le second dérive par variation du sujet de fugato du mouvement précédent. À l’apogée, tous deux se combinent et la sonate s’achève dans un climat de triomphe conquis de dure lutte, les dernières mesures venant prodigieusement confirmer le ton principal. Le pianiste Walter Gieseking, qui vit chaque sonate sitôt manuscrite, la tenait pour la plus belle des trois. Dans sa première mouture, la Sonate nº 1 avait un autre deuxième mouvement, intitulé Variations («Variationen»). Mais Gieseking, qui devait la créer à la fin de l’année 1936, voulut autre chose et Hindemith, accédant à sa demande, imagina la marche lente que nous connaissons. Ces variations, parues seulement après la mort de Hindemith, comportent un autre sujet de marche lente (différent de celui du mouvement de remplacement). Elles couvrent une large palette expressive—avec, notamment, une splendide et vaste variation arioso marquée par l’usage de trilles—mais certaines sont plus dissonantes et hachées que le reste de la sonate; la conclusion est austère, lugubre. Gieseking sentit peut-être que l’intransigeance de ce mouvement pourrait irriter les autorités nazies. Finalement, cela ne compta guère: courroucées par l’accueil chaleureux que Genève venait de réserver à une nouvelle sonate pour violon de Hindemith—et conscientes, peut-être, de la dimension politique du recours au poème de Hölderlin, sur le thème de l’exil—, ces autorités interdirent l’exécution de la sonate pour piano. En réalité, Hindemith devra attendre la fin de la Seconde Guerre mondiale pour qu’une de ses œuvres soit de nouveau créée en Allemagne et, même si ses éditeurs se précipitèrent pour imprimer ses trois sonates, il se peut que, suite à l’annulation de la création, par Gieseking, de la sonate nº 1, les véritables créations publiques des deux premières sonates n’aient pas été documentées. La troisième, elle, fut créée en avril 1937 à Washington DC, lors de la première tournée américaine de Hindemith, par le virtuose portoricain Jesús María Sanromá (pour lequel Hindemith composera une sonate pour duo pianistique et un concerto pour piano). Paul Hindemith, der verschiedene Instrumente ausgezeichnet beherrschte (er behauptete einmal, er könne jedes Orchesterinstrument wenigstens einigermaßen spielen) war ein äußerst fähiger Pianist. Seit seinen frühesten Jahren komponierte er Solo-Klaviermusik. So war sein erstes öffentlich aufgeführtes Werk ein Variationenzyklus für Klavier, der 1913 am Hochschen Konservatorium in Frankfurt gespielt wurde, an dem Hindemith studierte. In seiner Studentenzeit lernte er auch zwei junge Pianistinnen kennen—Emmy Ronnefeldt und Emma Lübbecke-Job, mit denen er sich eng anfreundete und die alle seine Werke für Klavier spielten, ob Solostücke oder Stücke für Klavier und weitere Instrumente. Nach Neigung und Beruf war Hindemith jedoch Geiger und Bratschist; in den 1920er Jahren, als er international bekannt wurde, komponierte er seine bemerkenswertesten Kammermusik- und Instrumentalwerke für Streicher: umfangreiche Sonaten, Trios, Quartette etc. Seine Klavierstücke aus der gleichen Zeit waren hingegen eher Gelegenheitswerke: kurze Miniaturen oder Tänze wie die vom Jazz beeinflußte Suite „1922“. Tatsächlich hatte er 1920 auch eine ambitionierte und experimentelle Klaviersonate komponiert, doch seine Verleger lehnten diese ab; bis heute hat sich daraus nur die barbarische Stretta vollständig erhalten. In der zweiten Hälfte seiner Karriere (nach der Komposition der Oper Mathis der Maler in den Jahren 1933–35 und der NS-Kampagne gegen dieses Werk, die schließlich seine Emigration aus Deutschland erzwang) komponierte Hindemith seine wichtigen Solo-Klavierstücke. Er hat wohl das Instrument als ideales Mittel zur privaten Meditation in schwierigen Zeiten und zu einer eher philosophischen Erforschung des Wesens der Musik selbst angesehen. Beide Aspekte kann man in den drei Klaviersonaten erkennen, die er im spannungsreichen Jahr 1936 komponiert hat. Sie sind gleichzeitig mit der Arbeit an seinem Lehrbuch Unterweisung im Tonsatz entstanden, in dem er die theoretische Basis für seine eigene Behandlung von Tonalität, Kontrapunkt, Formstruktur und allen Aspekten der Komposition schuf. Diese Arbeit war in gewisser Weise durch die Angriffe der Nationalsozialisten noch dringender geworden: diese hatten ihn als „atonalen Geräuschemacher“ und seine Musik als stümperhaft verunglimpft; das war umso ärgerlicher für Hindemith, als seine reife Musiksprache nun gefestigt war. Die Sonaten könnten als Lehrstücke in diesem Idiom gelten. Hindemith scheint darin das Klavier als Instrument gesehen zu haben, das mehr oder weniger neutrale Klangfarben erzeugt, so dass die Klänge, Themen und Linien in ihrer Bewegung und Verflechtung ohne Ablenkung verfolgt werden können (was nicht heißt, dass es ihnen an Farbe, Licht und Schatten fehlt, die jeder gute Pianist hervorheben wird). Hier, wie auch in seinen fast gleichzeitigen Orgelsonaten, zeigt sich Hindemith nicht als Rebell und Revolutionär der 1920er Jahre, sondern vielmehr als Erbe des kontrapunktischen Könnens und der geschickten Behandlung der Tastatur von Johann Sebastian Bachs. Ein Jahr zuvor, 1935, hatte er (noch während der Arbeit an Mathis der Maler) mit der Vertonung einiger bedeutender Lieder nach Texten des romantischen Dichters Friedrich Hölderlin (1770–1843) begonnen; und die Anregung durch Hölderlin übertrug sich auf interessante Weise auch auf die Klaviersonaten. Hölderlin, der sich zeitweise in und in der Nähe von Frankfurt (wo Hindemith von 1905 bis 1927 lebte) aufgehalten hatte, wurde um 1806 geisteskrank und verbrachte die letzte Hälfte seines unglücklichen Lebens in einem Turm an der Tübinger Stadtmauer. (Hindemith bewohnte in Frankfurt ebenfalls einen Turm, den sogenannten Kuhhirtenturm.) Hölderlin war zwar zu Lebzeiten kaum bekannt, deutsche Komponisten haben sich seiner Dichtung jedoch immer wieder in Zeiten der Bedrängnis und Seelenqual zugewandt, von Brahms (im Schicksalslied) bis zu den meisten avantgardistischen Komponisten des späten 20. und frühen 21. Jahrhunderts. Sein romantischer Extremismus scheint im Gegensatz zu Hindemiths Ausgewogenheit und handwerklichem Können zu stehen, obgleich beide Künstler auf je eigene Weise passionierte Klassiker waren. Hölderlin ist der unvergleichliche Dichter des Leidens an den Einschränkungen der Gegenwart und andererseits der Sehnsucht nach einer bedeutenderen Vergangenheit; der Dichter der leidenden Menschheit und herzloser (oder abwesender) Götter. Aber seine Sehnsucht ist nie bloße Nostalgie: er war ein glühender, tief von den Idealen der Französischen Revolution beeinflußter Demokrat, der ungeduldig den Sturz der alten deutschen Duodezfürsten ersehnte. Die Klassik, die so oft in seiner Dichtung beschworen wird, stand für eine vergangene, harmonische Welt, aber auch als eine Quelle für neue politische Hoffnung, die sich mit dem Befreiungskrieg der Griechen gegen die Türken im ausgehenden 18. Jahrhundert eröffnete (Thema von Hölderlins Roman Hyperion). Die NS-Propagandamaschinerie versuchte, Hölderlin als deutschen Patrioten darzustellen, aber sein demokratischer Idealismus widerlegte dieses Zerrbild. Somit hatte Hindemiths Hinwendung zu Hölderlin im Jahre 1935 eine politische wie auch eine ästhetische Dimension. Obgleich Hindemith Deutschland förmlich erst 1938 verließ, verbrachte er in der Mitte der 1930er Jahre möglichst viel Zeit außerhalb des Landes, um politische Einschränkungen zu vermeiden und weiter frei komponieren zu können. Die ersten beiden Klaviersonaten wurden zum großen Teil während eines ausgedehnten Aufenthalts in der Türkei komponiert, wo Hindemith auf Einladung der türkischen Regierung das staatliche Konservatorium in Ankara aufbaute. Die Klaviersonate Nr. 1 in A-Dur (in Hindemiths Harmonik verbinden sich Dur- und Mollelemente, generell werden diese Werke jedoch nach Dur aufgelöst) ist die umfangreichste der drei Sonaten und hat eine ungewöhnliche Form mit fünf Sätzen, wobei der vierte die Thematik des ersten wiederholt; keiner der Sätze weist eine konventionelle Sonatensatzform auf. Diese Gestaltung spiegelt die Anregung durch Hölderlins Gedicht Der Main wider. In dieser inbrünstigen Dichtung spricht der deutsche Dichter von seiner Sehnsucht, ferne Länder zu sehen, insbesondere Griechenland mit den Monumenten antiker Kultur und dem idyllischen Leben auf den „Inseln Ioniens“, wo „süßer Wein und Pauk und Zithar / Zum labyrinthischen Tanze ladet“. Dann definiert er seine Sehnsucht neu: er ist in Wirklichkeit ein „heimatloser Sänger“, und dieses imaginierte Paradies kann sein Vaterland nicht ersetzen. Aus der Ferne wird er sich sogar noch stärker nach dem Ort sehnen, an dem er einst glücklich war, am Main. Dieses Loblied auf den Fluß, an dem Frankfurt liegt, sprach Hindemith zweifellos genauso eindringlich an wie den melancholischen Hölderlin, der dort die flüchtige Zeit seines größten Glücks in der unseligen Liebesbeziehung zu Susette Gontard erlebte. Wie bereits erwähnt, komponierte Hindemith seine Sonate noch weiter entfernt von Deutschland, als es Griechenland ist: in der Türkei, dem antiken Kleinasien, wo er jene Ruinen der klassischen Antike (die Hölderlin tatsächlich nie sah) in der wachsenden Gewißheit besichtigen konnte, dass eine Rückkehr in die Stadt am Main, in der seine Familie noch lebte, bald nicht mehr möglich sein würde. Die Sonate lehnt sich eng an Hölderlins Gedicht an, nicht so sehr als programmatische Schilderung, sondern als instrumentales Korrelat: die Musik erscheint abstrakt im Ausdruck, und die korrespondierenden Gefühle bleiben implizit. Der kurze erste Satz dient mit seinen weich fließenden Vierteln als lyrisches Einleitung, die die Beschreibung des Gedichtanfangs von der Reise über Berg und Meer wiedergibt. Er könnte sogar ein „Lied ohne Worte“ sein, eine rein instrumentale Vertonung oder Lesart der ersten beiden Strophen von Hölderlins Gedicht. (Hindemith hat Dichtung gelegentlich in dieser Weise behandelt, z. B. in der frühen Lustigen Sinfonietta nach Gedichten von Christian Morgenstern und im viel späteren Hornkonzert, das die wortlose Vertonung eines eigenen Gedichtes enthält.) Dieser relativ kurze Satz bereitet auf einen wesentlich längeren vor: einen langsamen und feierlichen Marsch von ausgesprochen elegischem Charakter, einer der eindringlichsten, innerlichsten von Hindemiths zahlreichen Einfällen im Marschstil. Dieser korrespondiert mit Hölderlins Beschwörung der zerstörten prachtvollen Monumente des klassischen und heroischen Griechenlands. Es folgt ein ausgedehntes Scherzo, welches die Verse über das idealisierte Leben auf den ionischen Inseln reflektiert: ein betont rhythmisches, tänzerisches Thema wird mit einem sanfteren, liedähnlichen kontrastiert; und dieser zweite Gedanke wird zur Basis des Trios in der Mitte. Der vierte Satz greift dann in abgewandelter Form auf das Material des ersten Satzes zurück, genau wie Hölderlin an dieser Stelle die Perspektive wechselt und von der Fantasie-Insel, die zum Ort seines Exils geworden ist, über den zurückgelegten Weg bis zu dem Ort zurückblickt, von dem er am Anfang aufgebrochen ist. Und entsprechend ist Hindemiths Finale ein wogender Satz (Lebhaft) in scheinbar nicht zu bändigender Bewegung, wie der letzte Teil des Gedichtes, in dem der deutsche Fluß hymnisch besungen wird, wenn er seinem Lauf folgt, um auf seinen „Bruder“, den Rhein, zu treffen, und endlich in die Nordsee zu fließen. Die beiden anderen Klaviersonaten von 1936, die im Juni nach Hindemiths Rückkehr aus der Türkei in Deutschland vollendet wurden, haben keine derartige Verbindung zu einem poetischen Inhalt—sollte es anders sein, schwieg er sich darüber aus. Die Klaviersonate Nr. 2 in G-Dur ist die kürzeste der drei und die leichteste im Tonfall—Hindemith selbst betrachtete sie als Sonatine. Während die erste Sonate einen Pianisten von erheblicher Kraft und Autorität verlangt, ist Nr. 2 bewußt für Amateure angelegt, von klarer Form und Textur und mit vielen zwei- oder dreistimmigen Kontrapunktpassagen. Zwei kurze, prägnante Sätze—der erste so durchsichtig, als wäre er von Clementi, mit kontrastierenden Themen, aber ohne eigentliche Durchführung, und dann ein Miniatur-Scherzo—bieten die Einleitung zu einem ernster klingenden dritten Satz, der langsam mit gravitätischer Melodik beginnt. Bald entpuppt sich diese gefühlvolle spannungsreiche Musik jedoch als bloße Einleitung zu einem heiteren Rondo-Finale, das abwechselnd stolziert und schlendert. Schließlich wird der Satz wieder langsamer, und mit einem kurzen Epilog endet die Sonate unerwartet düster. Die Klaviersonate Nr. 3 in B-Dur wurde unmittelbar nach den beiden anderen komponiert (von Juli bis 20. August); sie ist umfangreicher angelegt als Nr. 2, strukturell jedoch äußerst straff, ohne jedes poetisches Ausschweifen wie in Nr. 1. Wie diese ist es jedoch ein anspruchsvolles Werk, das offensichtlich mit einem Virtuosen vor Augen geschrieben wurde. Von Hindemiths drei Sonaten nähert sich Nr. 3 am engsten dem klassischen Sonaten-Ideal an (tatsächlich dem Beethovenschen viersätzigen Archetyp, der Generationen von Komponisten im 19. und 20. Jahrhundert inspiriert hat), und sein Material wird höchst markant und einfallsreich entwickelt. Doch wiederum vermeidet Hindemith einen energischen Kopfsatz mit rivalisierenden Themen im Sonatenstil. Die dritte Sonate beginnt vielmehr mit einem lyrischen, ruhig fließenden Satz von fast pastoralem Charakter, der übrigens vorausweist auf das klare, erhabene Idiom von Nobilissima visione, der Tanzlegende über das Leben des Heiligen Franz von Assisi, die Hindemith 1937 komponiert hat. Darauf folgen ein energisches Scherzo mit Trio und dann ein Satz in gemäßigtem Tempo, der sich nach einer ruhig schreitenden Introduktion zu einem geschmeidigen, dialogisierenden Fugato entwickelt. Dieser fugierte Stil läßt den Finalsatz ahnen, der die Sonate mit einer granitenen, zielstrebigen Doppelfuge krönt. Das erste Thema ist drahtig und sportlich; das zweite ist als Variation vom Fugatothema des vorigen Satzes abgeleitet. Bei der Klimax werden beide Themen kombiniert, und die Sonate endet in einer Stimmung hart errungenen Sieges, wobei die Schlußtakte die Grundtonart eindrucksvoll bekräftigen. Der Pianist Walter Gieseking, der jede der Sonaten anschauen konnte, sobald sie im Manuskript vorlag, hielt diese Sonate für die beste von den dreien. Bei ihrer Vollendung hatte die Sonate Nr. 1 zunächst einen anderen zweiten Satz mit dem Titel Variationen. Doch Gieseking, der die Erstaufführung Ende 1936 spielen sollte, forderte Hindemith auf, etwas Anderes zu schreiben, und der Komponist lieferte bereitwillig einen langsamen Marsch als Ersatz. Die Variationen wurden erst nach Hindemiths Tod veröffentlicht. Auch diese hatten ein langsames Marschthema (das sich von dem Thema des neuen Satzes unterscheidet). Die Variationen umfassen eine weiten Ausdrucksbereich, u. a. mit einer schönen ausgedehnten arioso-Variation mit Trillern, doch einige Variationen sind dissonanter und kantiger als der übrige Stil der Klaviersonate, und der Schluß ist sehr grimmig. Gieseking meinte wohl, dass dieser kompromißlose Satz bei den NS-Behörden anecken könnte. Letzten Endes machte es kaum etwas aus: irritiert durch die gute Aufnahme einer neuen Violinsonate von Hindemith kurz zuvor bei ihrer Erstaufführung in Genf (und vielleicht im Bewußtsein der politischen Dimension, die die Verwendung von Hölderlins Gedicht mit seiner Exilthematik suggerierte) verboten die gleichen Behörden die geplante Aufführung der Klaviersonate. Bis nach dem Zweiten Weltkrieg fanden tatsächlich keine weiteren öffentlichen Premieren von Hindemiths Werken in Deutschland statt. Obgleich seine Verleger alle drei Klaviersonaten schnell druckten, gibt es, infolge der Absage von Giesekings geplanter Premiere von Nr. 1, für die tatsächliche öffentliche Erstaufführung der ersten beiden Sonaten offensichtlich keinerlei Beleg. Nr. 3 wurde jedoch im April 1937 in Washington DC während Hindemiths erster Konzertreise durch die USA von dem puertorikanischen Virtuosen Jesús María Sanromá uraufgeführt (für ihn schrieb Hindemith später eine Sonate für Klavier zu vier Händen sowie ein Klavierkonzert).